When you become an affiliate partner, you will receive a unique coupon code that can be redeemed in the online Flixel Store. Customers who purchase a Flixel plan using an affiliate coupon code will receive a 10% discount on their purchase. The affiliate whose coupon code was used will receive 10% recurring commission on their sales. Affiliates will receive a unique coupon code within a few days of signing up to become an affiliate partner. As an affiliate, you can share your coupon code with your audience on social media, video sharing platforms, websites and blogs, and email newsletters to promote our plans and earn commission on your sales. Coupon codes can be redeemed in the online Flixel Store available on flixel.com or the in-app store in apps downloaded from flixel.com. You can either share your coupon code by itself or in a direct link. If you share your coupon code by itself, customers must select Add Coupon on the checkout window before selecting a payment method to apply the discount. Once the coupon code has been applied, the customer can proceed to pay by card, PayPal, or purchase order. If you want to direct customers to the online Flixel Store with your coupon already applied, you can insert a hyperlink; simply replace the example text in the link below with your unique coupon code and the discount will be applied when customers proceed to checkout. 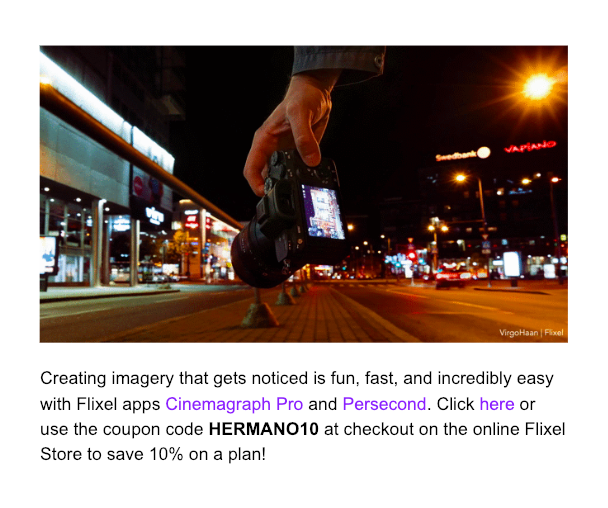 To get the most out of the affiliate program, we recommend sharing your coupon code with imagery created in Flixel apps. 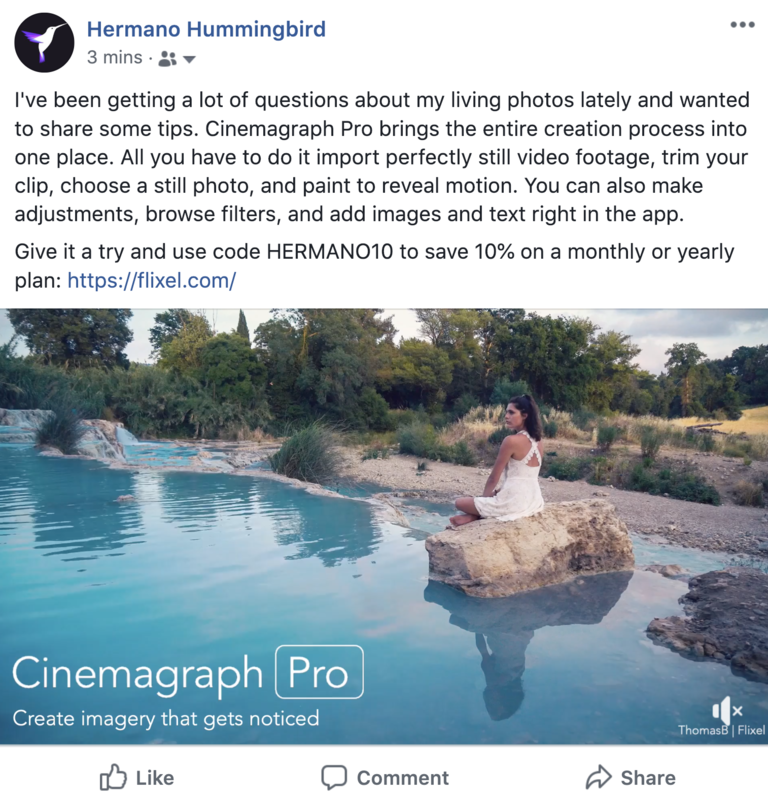 Known for their ability to capture attention and drive results, cinemagraphs are the perfect medium to promote our plans to your audience and earn commission on your sales. 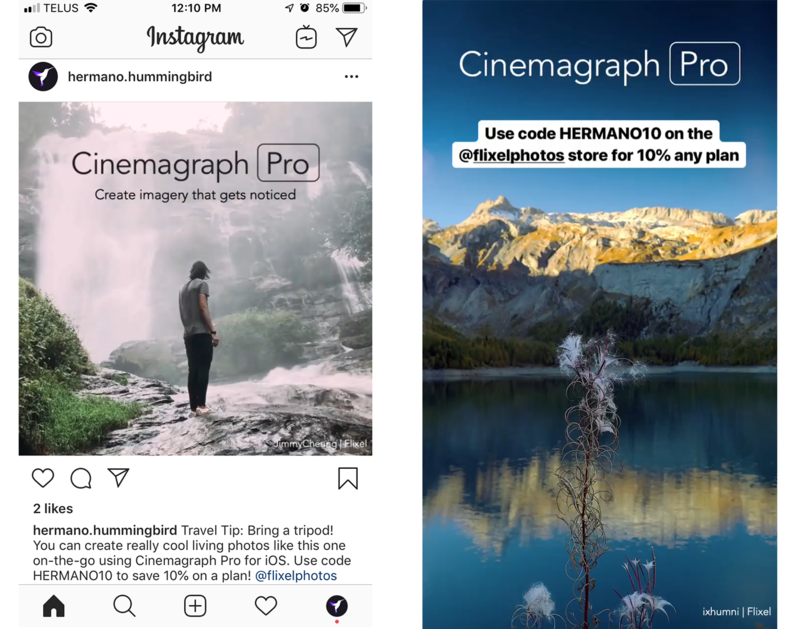 If you choose to design marketing assets featuring your own cinemagraphs, you can use overlay mode in Cinemagraph Pro to add the app's logotype and/or your affiliate coupon code. 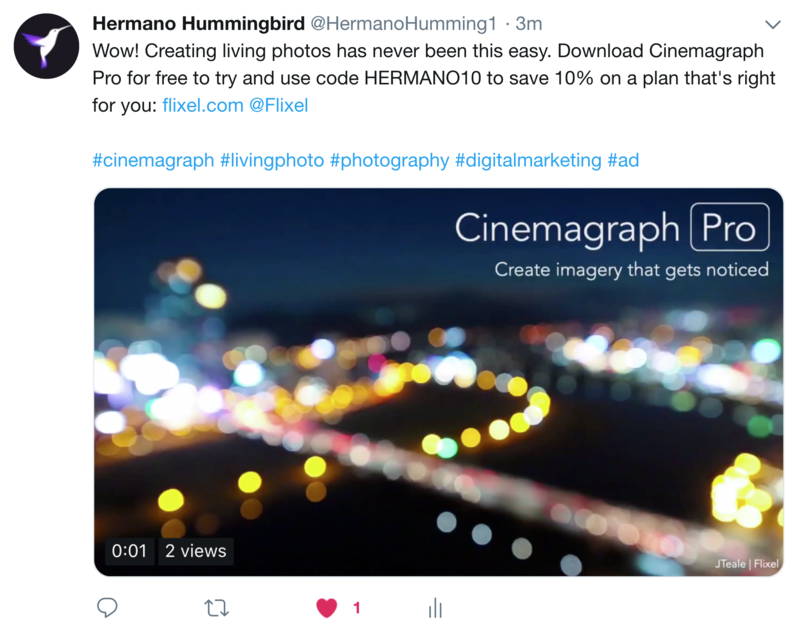 You can then use the export presets in Cinemagraph Pro to optimize your marketing assets for Facebook, Twitter, Instagram, email and more. Affiliates will receive 10% recurring commission on all sales made using their unique coupon code. The minimum payout amount is $10 USD and payouts will occur monthly via PayPal. Please contact affiliates@flixel.com if you have any questions about the Flixel Affiliate Program! We look forward to partnering with you.